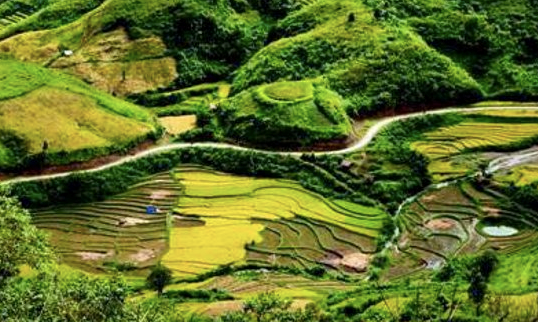 (VOVWORLD) - Lai Chau province in the Northwestern region of Vietnam is known for its magnificent landscapes, rich culture, and great tourist attractions, such as Sin Suoi Ho village, Hoang Lien National Park, the Tien Son Caves, and Ta Leng pine forest. It’s said that this is now the best time to come here and explore the province’s attractions. A: On today’s show, we’ll take you to a province in the Northwestern region of Vietnam. This province is known for its magnificent landscapes, rich culture, and great tourist attractions, such as Sin Suoi Ho village, Hoang Lien National Park, the Tien Son Caves, and Ta Lien Son forest. Can you guess where we’re going? B: Sin Suoi Ho and Hoang Lien Son are in Lai Chau province. A: Exactly. There is a lot to explore in this province. It’s said that late Spring is the best time to come here. B: Let’s explore Sin Suoi Ho village, maybe the most famous tourist attraction in Lai Chau province. The road from Lai Chau city to the village winds along slippery slopes and steep inclines shrouded in clouds. A: My first impression upon visiting Sin Suoi Ho village in the spring was that the area was a paradise of beautiful cymbidium orchids. B: In the spring, the village is a favorite destination for orchids lovers. Through the dense white mist, obscuring the road to the village, tourists see cymbidium orchids in every garden and bordering every path. Cymbidium orchids in Sin Suoi Ho. 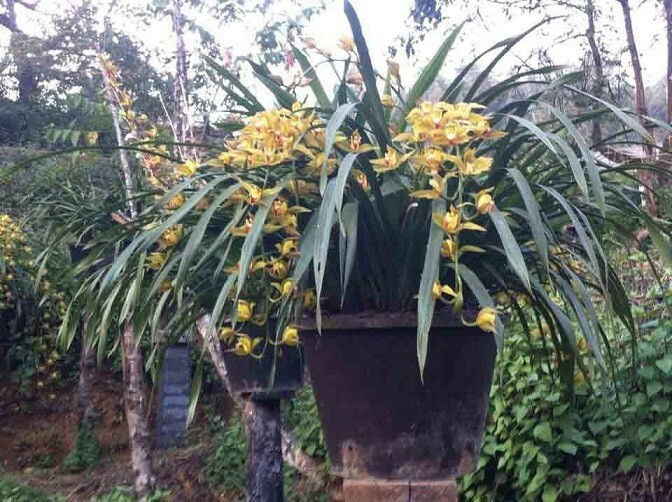 A: Most of the Mong ethnic people here grow orchids. Mr. Vang A Chinh, the head of Sin Suoi Ho village, says the villagers grow orchids all year round to make money and to beautify the neighborhood: “This year my family planted more than 500 orchid pots. When the garden is full, we plant orchids along both sides of the road to attract more visitors. Orchids are not only beautiful, they generate a good income”. B: An elevation of more than 1,500m above sea level, abundant moisture and light, and fertile soil create good conditions for Cymbidiums to grow. A local man named Hang A Sa told us that it still requires skill and care to grow beautiful flowers: “At first, we went deep into the forest to find rare orchid varieties. Later, we learned to grow and transplant various kinds of orchids. Each pot has at least 10 orchid branches. Cymbidiums are in full bloom in the spring time”. A: That’s why spring is the best time to visit Sin Suoi Ho. B: While we’re in Sin Suoi Ho, we shouldn’t miss the chance to visit the local village fair. A: Sin Suoi Ho village is about 30 km from Lai Chau city. Its fair has become a great tourist attraction. Sep Drumtin, a British visitor, is excited to visit the market: “I like this fair. It’s colorful but not crowded like other market places. The local people are very friendly. As a foreigner, I like exploring new places”. B: We’re so surprised at Drumtin’s Vietnamese. This is the third time he has visited Sin Suoi Ho. We follow Mr. Hang A Sa to explore the market. 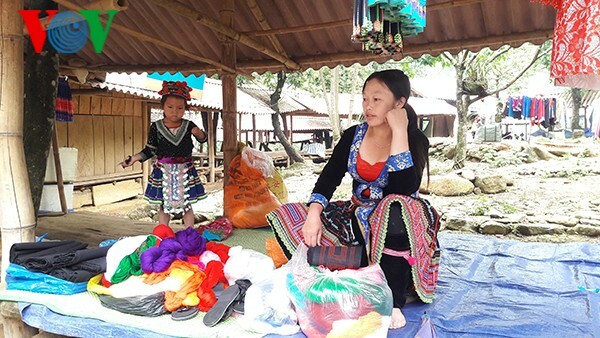 The market is very busy, selling colorful brocade clothing, meat, vegetables, and housewares. The village fair takes place only on Saturday, serving not only as a market place but also a venue for local people to meet and chat. Hey A, what will you buy at the market? A: I think I’ll buy a brocade item for my friend. B: A group of visitors from Ho Chi Minh City seem to be interested in a stall where local women are embroidering pictures and drawing with beeswax: “The fair is so colorful and exciting. Sin Suoi Ho market still preserves typical features of the locals. The products are varied and cheap”. A: Let’s try drawing with beeswax with the help of a local woman named Thao Thi Ghenh: “I started this class for local people and people from neighboring areas. It’s difficult at first. All lines must be steady to be beautiful. Many patterns are really time-consuming”. B: I feel so comfortable here where sellers, buyers, and visitors are like close friends. I have bought some vegetables and brocade clothes. But it doesn’t matter if you don’t buy anything. Just come and enjoy the exciting atmosphere with the local people. We meet Sep Drumtin again. He has drunk the local wine: “I’ve made many new friends here. Some even invited me to have a meal with their family. The local food is delicious and the people are friendly”. A: Welcome back to the Sunday show on the Voice of Vietnam. Today we’re touring Lai Chau province. B: Leaving the busy village fair, we head for Ta Leng pine forest, another tourist attraction in Lai Chau. The forest’s mild temperature, peacefulness and stunning scenery, make it a popular destination for nature lovers. A: To get to the forest we follow winding roads past lush green tea fields and terraced fields dotted with small houses. A rough path leads into the pine forest. Forest ranger Giang A Minh told us: “This used to be a bare hill. In 2003, we started planting pine trees here. At first, there were a few thousand trees. Then more and more locals responded to the idea and developed it into a forest”. B: We’re stopping to take a photo of colorful pin wheels. In the middle of breathtaking scenery, thousands of pin wheels arranged in the shape of the letter U form a perfect backdrop for some photos. Nguyen Thanh Tu is here with some friends: “We are really having a nice time here. The fresh air, natural beauty, and man-made features make Ta Leng pine forest a good place to to relax and communicate with nature”. A: We are walking up stone steps in the shadow of large pine trees. 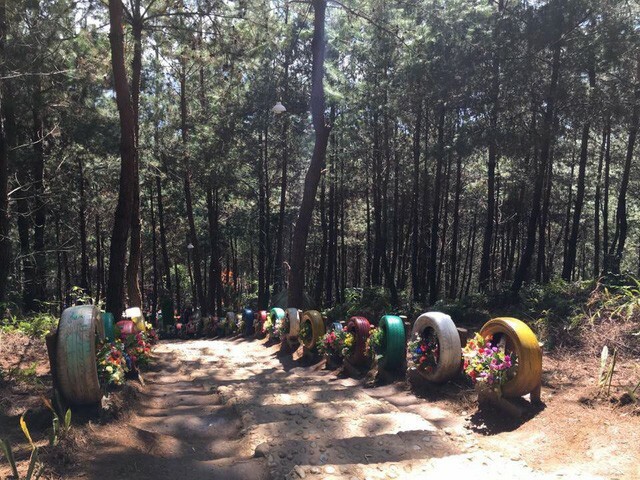 Ta Leng pine forest has been called “Da Lat City” in Lai Chau. On both sides of the path are flower gardens. Old car tires have been hung as swings for kids. Along the path to the top of the hill are small cottages, built as stop-overs where visitors can rest and enjoy the scenery. Visitor Tran Tuan Anh told us: “The cottages are made of bamboo and pinewood and have unique designs. Ta Leng pine forest has become a favorite destination for young people who want to explore new places”. “The air is fresh and the local people are friendly”. “The scenery is spectacular. We can climb up the hill to enjoy the view or play in the river. Standing on top of the hill gives us a breathtaking view of terraced fields and pine trees”. 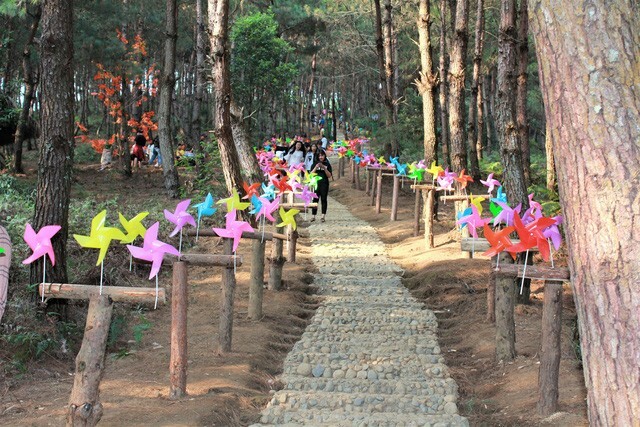 A: Magnificent natural scenery, unique man-made features, and mild weather make Ta Leng pine forest – a great tourist attraction.